SANGIN, Afghanistan – For a minute, it seemed like a manhunt in the hills of the Upper Sangin Valley was possible. Pushing out from Forward Operating Base Tabac early Saturday, Marines with Dog Company, 1st Battalion, 7th Marines, noticed a man on a nearby hill holding a metallic black object that was glinting in the sunlight. The assumption: The stranger was carrying a radio, making it entirely possible a Taliban spotter was spying on the patrol. Over the next 20 minutes, the reinforced squad with Dog Company’s 3rd Platoon made its way up a steep rocky hill in northern Helmand province. The Marines weaved there way around a rocky cliff and through an eerie cemetery. Its graves were marked with carefully placed rocks and brightly colored flags. Quickly, the Marines found their man. The shepherd was at least 70 years old, and sported a long, flowing white beard. He laughed nervously, explaining in Pashto that he was merely taking his flock of sheep out for the morning from his nearby home. The radio in his hand played music, and couldn’t transmit anywhere else. The incident highlights the restraint Marines must show, even as they patrol a notoriously hostile land. 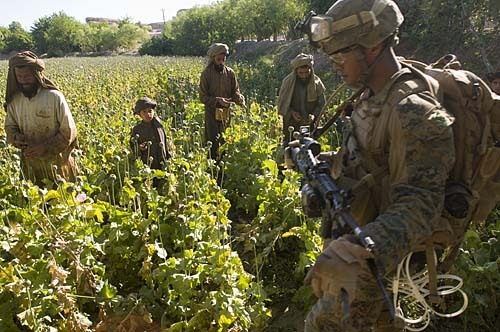 Sangin district remains one of the most dangerous regions in which Marine forces are deployed, but the average lance corporal still must think before acting to avoid hurting civilians such as the shepherd. On Saturday, the patrol pushed out early, led by Sgt. Anthony Garbo. The Marines swept through muddy fields, rocky trails and murky canals for more than eight hours to gain a better understanding for the villagers living in the immediate area. Our boots were soaked several times as we made our way through several villages. Timing was key. The cash crop in Helmand is opium-producing poppy, and harvest season has arrived. Migrant workers travel long distances to work the fields but are mixed in with insurgent fighters from other regions, Marines said. In some cases, the workers will pick up a paycheck and return home. In others, they’ll pick up an assault rifle and open fire on coalition forces. 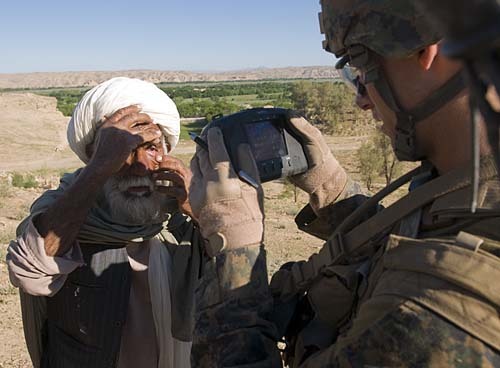 To combat that uncertainty, Marines in Sangin are now actively collecting biometric information in the field. They use a hand-held device known as HIIDES, or Handheld Interagency Identity Detection Equipment System, to compile and compare fingerprints, DNA, photographs and iris scans, each of which can be used to see if an individual has a sinister past. The Marines on patrol with photographer James J. Lee and I today stopped dozens of workers, and registered at least 40 men in their system. None of them popped immediately in the system as insurgents, but if those same individuals are implicated in something down the road, coalition forces will have a number of ways to track them down. There’s no better time to do it, considering the traditional Afghan fighting season will begin with days, after the harvest is complete. As a footnote, we have since moved on from Dog Company, arriving Saturday night at Forward Operating Base Shamsher. It’s headquarters to Baker Company 1/7. We’ll be spending several days with Baker getting the lay of the land and visiting with Marines. Awesome article son (sanders1/7) your famous. Lol. Take care. God speed! Love you. That patrol leader is something special, seen him in the news before. Thanks Dan, it is great to hear about the good things our boys are doing. Stay Safe! Love You Anthony!!! As a former Marine, I am sick and tired of the attacks on Enlisted Marines and what they do or don’t do. The Officer Corps, especially the Senior Officer Corps starting with the CMC, needs to stand up and back up their men. The enlisted Marines are the ones doing the ‘In the face’ DAY In and DAY OUT combat operations,making the ACTUAL Life and Death decisions and dealing with Life and Death decisions all the rest of their lifes. Do’t tell me (us) you are doing the same, so some respect. In every one of our WARS/POLICE ACTIONS, servicemen have taken pictures etc. These may to please the Politically Correct or others, but those who have done the actual fighting understand it, part of it is to intimidate the enemy and part is a stress release. Maybe it is time to set an example and if you think you are, check again. This would include our fine civilian elected and appointed goverment employees. DC sets such a fine example for all of us. Do you demand respect or have you earned it? If you demand it, you better realize it doesn’t exist and Politically Correctness is not helping any of you. You have and are doing a great job of destroying what the REAL Marine Corps was. I want to Thank not only Trevor Wiren for keeping all of his family and friends safe but also for those families that he doesnt know safe. Im sure it is a completely different life style over there then any man or woman is used to here in The United States of America. Where we are the land of the FREE and HOME OF THESE BRAVE MEN & WOMEN. God Bless all of you and come home soon.